It normally takes multiple attempts to reach your customers. In that case, you may want to run a new campaign, for example, to call people that your previous campaign are answerd by a machine. There are multiple ways you can accomplish this. The following sections show two popular methods. After a campaign is finished, go to the campaign summary page, then click the Campaign Details button. Choose the View button to select a particular result, such as "Machine Answer". Then click the Save As Contact List. You can then use the new list for a new campaign. Please note do not delete the original campaign if you use this method. Also you can use different types of tool, such as a text message campaign, for the new campaign. Click here to see more info on Campaign Call Status. Go to the same Campaign Details page as shown above. 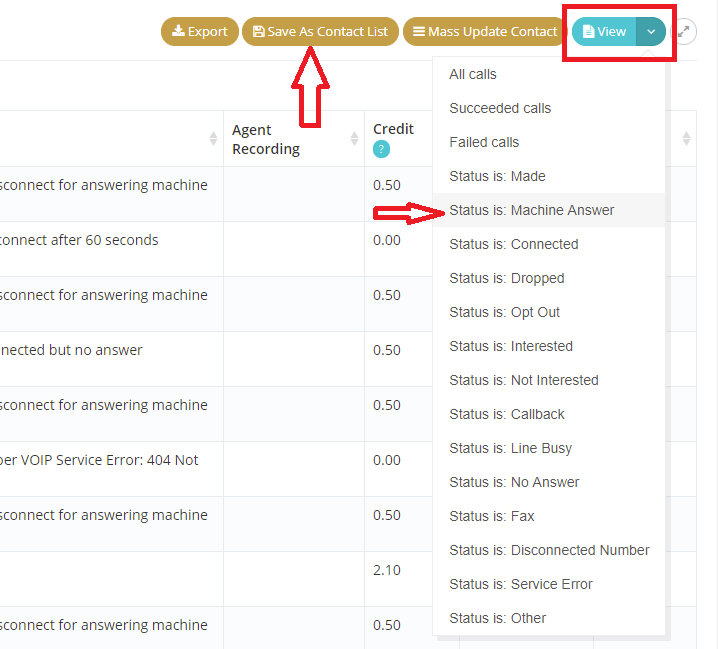 Select a view for certain call status, then click the Mass Update Contact button. Once updated, you can then use Advanced Search to define a new campaign list. For example, you can choose the same list used in the previous campaign, (an imported list is all contacts that shared the same lead source), and only those with specified category. Save the search. You can now run a new campaign based on the search result. If Do Not Call field is checked for a contact record, the contact record will be automatically skipped for campaigns. So, for example, if you just want to skip records that the call status is "not interested", use mass update to set the Do Not Call field for these records. You can then simply rerun your campaign with the same list.